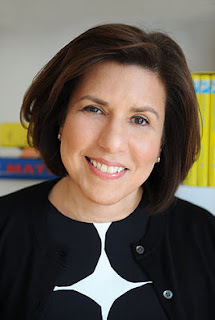 SUSAN ELIA MACNEAL: Today I'm delighted to introduce debut novelist and Bostonian Pamela Wechsler. Her novel, MISSION HILL, set in Boston and featuring homicide chief Abby Endicott, has been getting rave reviews. Publishers Weekly says, "Though the swiftly moving plot offers plenty of surprises, it’s the realism with which the author, a seasoned Boston criminal prosecutor who’s now a legal consultant for TV shows, depicts varied worlds from Brahmin glitzy to Roxbury gritty that will make readers eager for Abby’s next adventure." And Associated Press says: "Screenwriter, TV consultant and former prosecutor Pamela Wechsler skillfully eases into "Mission Hill," her debut legal thriller featuring the intriguing Abby Endicott, chief of the Boston district attorney's homicide unit. Wechsler's multilayered plot realistically touches on legal ethics, political intrigue and construction double-dealings with aplomb with plenty of twists." Abby Endicott is chief of the District Attorney's homicide unit in Boston, where she investigates and prosecutes the city's most dangerous killers. She attended the elite Winsor School, graduated from Harvard Law School, and has been known to change into an evening gown amidst bodies in the morgue. She loves her job, and is committed to it, but among Abby's many secrets is her longtime affair with fellow prosecutor Tim Mooney, a married father of one. PAMELA WECHSLER: I’m a fan of any book that uses Boston, not as a setting, but as a character. That’s why Robert Parker and his Spenser series are among my all time favorites. I’ve always enjoyed Parker’s sharp dialogue and minimalist style, but it’s the way he wrote about Boston that kept me coming back for more. I loved reading about my home city, and all of its familiar landmarks, through Spenser’s eyes. When I was growing up, my father had an office in the Back Bay, not far from where the fictional Spenser lived and worked. Sometimes, I’d visit my dad at work, and when I was waiting for him to finish a phone call or wrap up a meeting, I’d peer out his conference room window and look across Berkley Street. If I concentrated hard enough, I could picture Spenser and Hawk, guns drawn, running up the Commonwealth Ave mall, chasing after a bad guy. Recently, I found myself passing through Spenser’s turf. 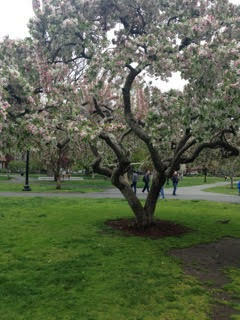 I took a walk up the center of the Commonwealth Ave. mall, past my father’s old office, and into the Public Garden. Usually, I use the park as a short-cut; it’s the quickest route when I have to get between Beacon Hill and Back Bay. Yesterday, it was a destination. 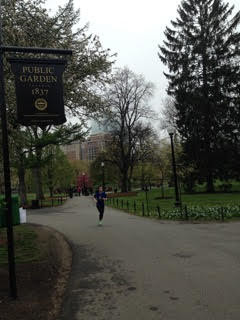 The Public Garden represents so much of what Boston has to offer; it has history, charm, quirkiness, and natural beauty. The scale is more manageable than its neighbor, the Boston Common, and it doesn’t host any commercial ventures, except an occasional film crew. There are no hot dog vendors or concerts, and so far, no Hemp Fest. I used to come to the park when I was a child, and very little appears to have changed. The Make Way for Ducklings statues weren’t there yet, but for me, they might as well have been—the image of that line of ducks was etched in my mind long before 1987, when the sculptures were installed. Like all Boston children, my mother used to read the Robert McCloskey book to me and my brothers night after night, at bedtime. The swan boats are exactly as I remember; in fact, it looks like they haven’t been renovated since they were first launched in the lagoon in 1877. Well, maybe the price is a little steeper, and the railings have a fresh coat of red paint, but the worn wooden seats look pretty much the same. A couple of live swans even made an appearance on the lawn, along the perimeter of the lagoon. The park is the oldest botanical garden in the country and May is the perfect time to take a stroll here, even when the weather is raw and wet, and the sky is foggy. Yesterday, the petals on the pansies and tulips were wilting from the change in temperatures, but the colors still held vibrant and bold. Most of the trees in the park are adorned with plaques, identifying each species. My favorites are the Crabapples, especially the light pink and white Tea Crabapple. There are scores of Belgian Elms, with gnarled roots and knobby trunks, and droopy Weeping Willows. 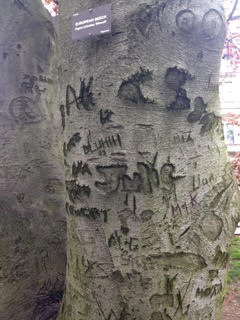 A European Beech is marked with carvings—names, initials, and what looks like hieroglyphs. Wendell Phillips, Champion of the Slave, stands tall on a pedestal, facing the Four Seasons Hotel. He’s standing at a podium, facing Boylston Street, as though he’s delivering an oration to the diners in the Bristol restaurant. Many of the benches in the park have memorial plaques. 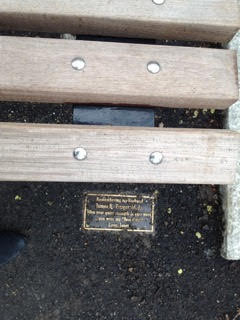 It felt almost disrespectful to sit on the wooden bench that Janet dedicated to her beloved husband, in recognition of his ‘quiet strength and easy ways’. I settled into the bench for a few minutes, and watched a couple of toddlers offer scraps of bread to the ducks. Joggers, dog walkers, tourists, and locals swirled around me, but all I could hear were quacking ducks and chirping birds. As much as I love the area, I knew I’d overstayed my welcome when my allergies kicked in, and I started to sneeze. On my way out of the park, a bride and groom posed for their wedding photos in front of the imposing statue of George Washington on his horse. As far as I can remember, Spenser never married his longtime girlfriend Susan Silverman, but if he did, this would have been the perfect spot. SUSAN ELIA MACNEAL: As someone who once lived in Boston, I loved your tour of the Public Garden (which I also preferred to the Common). Reds and lovely readers, how important is setting to you? Does it seem like another of the novel's characters in the hands of some authors? What makes a setting come alive for you? Please tell us in the comments! PAMELA WECHSLER spent over fifteen years working as a criminal prosecutor at the local, state and federal levels. She has served as an assistant district attorney and assistant attorney general in Boston, and she was a trial attorney for the Department of Justice in Washington, D.C. She has investigated and prosecuted a wide variety of crimes, including: murder, witness intimidation, sexual assault, drug trafficking, stock market manipulation, and political corruption. About ten years ago, Pam moved to Los Angeles to work as a legal consultant and writer for network television shows. Her credits include: Law and Order; Law and Order: Criminal Intent; Law and Order: Trial by Jury; Conviction; and Canterbury's Law. Pam grew up in the Boston area and is a graduate of Tufts and Boston area and is a graduate of Tufts and Boston University School of Law. Currently, she is consulting on television shows, and working on the second Abby Endicott novel. Congratulations on your book, Pamela . . . “Mission Hill” sounds intriguing and I’m looking forward to reading it. 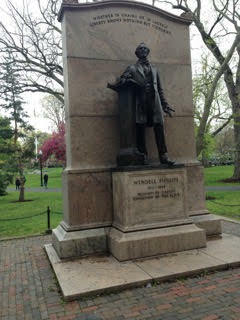 Thank you for the tour of the Public Garden. 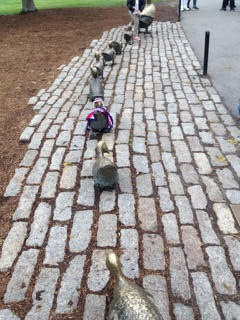 As a fan of “Make Way for Ducklings,” I loved that line of ducks! Some of the books I enjoy the most are those in which the setting becomes a character . . . the cold Adirondack winter in Julia’s stories comes immediately to mind . . . and pulls the reader into that place. Welcome, Pamela! I grew up in LA and moved to the Boston area (Hallie, too), so we've swapped. The book sounds fascinating. I also love the Public Garden, and took my son to his friend's second birthday party - a swan boat party - there in 1988. I hadn't realized the ducks were so new then! Hello, Pamela! MISSION HILL is fabulous and I can't wait for the Reds to read it, too! I love, love, love Boston, having gone to college there and then in Sommerville (before it was trendy) and for a brief shining moment in a sublet on Beacon Hill. As the Public Garden was one of my favorite places to go to, I love this post! And I love how much Boston is a character in your books. Welcome, Pamela! 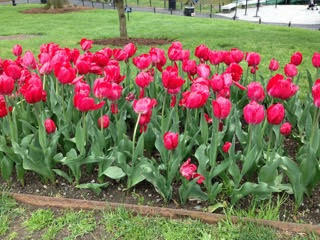 We live in a suburb of Boston and the Public Garden, especially at this time of year, is a favorite place to visit. The plantings are always spectacular, and who can resist a ride on the Swan Boats. One of my daughters best friends (she went on to qualify for the Olympics track team) spent a summer piloting a swan boat (it's basically a big bicycle that gets pedaled around the lake. The Mission Hill neighborhood is just about as far from bucolic Public Garden as you can get. Can you say something about how you used that neighborhood in your book? One of the key scenes in the book, a wake, takes place in Mission Hill. There's a beautiful church in the neighborhood, made of Roxbury puddingstone. Next week, I'm going to move from Boston back to LA. I'm really going to miss this city! Congrats on the new book and those wonderful reviews Pam! 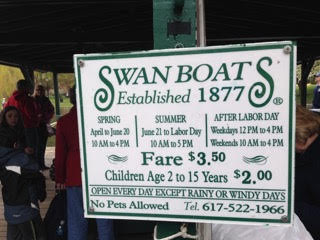 Isn't it funny, as many times as I've been to Boston, I've never ridden on a swan boat. But that reminds me so much of THE TRUMPETER OF THE SWAN by EB White, which we listened to many times with our kids, driving back and forth from CT to Vermont. Next time you're in Boston, take a walk around the Public Garden and hop on the swan boats. I promise that you'll be glad you did. And Pam, Jonathan and I had our wedding photos taken in the Public Garden--and they are amazing The light is golden, and. you can see ducks in the background--so funny. Hank, I'm thrilled to have you and Susan on my book. Thanks so much for the blurbs! And, yes, something is new! I moved back to Boston five years ago, and started the Abby Endicott series. The next book will be out in 2017. In the meantime, I'm moving back to Los Angeles to join the staff of a new television show. It's called DOUBT and will be airing midseason on CBS. I'm really excited! I'm always happy to see a new series set in Boston, one of my favorite cities. I want to see if ADA Endicott gets interviewed by reporter Jane Ryland eventually...or if you're going for Boston real, interviewed by Hank Ryan from channel 7! Such a fun idea! Either one would be great. Pam, congrats on DOUBT and all good wishes for your move to LA. Now, does this mean Abby Endicott will be moving to LA? Or will she stay in Boston? Thanks Susan! Abby will stay in Boston, at least for the next two books in the series. I don't think she'll ever leave Boston, plus I don't think she wants to take the California bar. So excited for you! (We mill miss you, though.) Tell us about DOUBT, and what you'll be doing! Hah, Julia beat me to the thought about Hank's Jane Ryland! Your debut sounds fantastic, Pam. Congratulations! Totally exciting to have debut out there, isn't it? Yippee! Oh yes: setting. Intrinsic to storytelling IMHO. What a lovely tour through Boston's Public Garden, Pam. I've never been to Boston (still can't believe that), but I now know that when I go, I will have to visit the Public Garden and take a ride on a swan boat. You made it come alive for me. 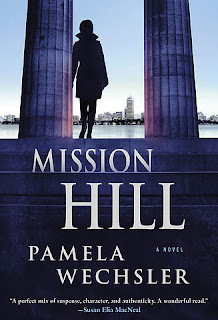 Congratulations on your debut book, Pam, and as someone who loves the setting as a character, I look forward to reading Mission Hill. Thanks and yes--lots of great writers are from Boston, including Dennis Lehane, Hank Phillippi Ryan and Hallie Ephron! Pam, congratulations on your book. 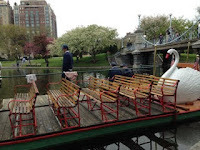 I remember the swan boats from my visit to the Boston public gardens when I visited Boston. Susan, yes the setting makes a difference. One author, whom I will not name, used to have her series in England. Now her novels are set in Hollywood and Las Vegas. I am sorry to say that I liked her books better when the settings were in England. Her books are more chick lit than mysteries. I just love the English village setting for my reading. Congratulations on your book! I wish you much success. It sounds exciting. I look forward to reading it. I spent several summers in the Boston area working as counselor in a camp so I know the city well. I too love the Common. To answer the question posed by Susan, I think setting is very important in a novel. The sights and sounds create the mood and atmosphere. For me, who has been an Anglophile since I was a little kid, I'm immediately attracted to any book set in England. Also since I fell in love with the enchanting watery world that is Venice, any book that takes place in that ethereal city jumps to the top of my reading list as well. Hank I think those ducks follow you and Jonathan back and forth between Boston and home! Pamela, half my family has lived in Boston forever. One of my high schools, the one I finally graduated from, was on Marlborough Street nearby the Garden. I walked through there every chance I had and sometimes taking the long way around and back to the library... just because. I remember crying the first time I saw the duckie statues. They were already well-formed in my mind, having grown up on their story, yet seeing their statues made me laugh and cry. They were my little buddies. I am looking forward to reading your book... sounds great, truly. I grew up on viewing crime from the defense perspective with my uncle Tommy Troy's entertaining rants at the kitchen table and every family gathering over a casket with poetry. Although I am primed to see the defense side, how could I not love a good legal thriller. Funny though, back then I didn't even know he was a lawyer. He just told great stories. I can tell you do, too, and will read your book as soon as it arrives.